Two Asian elephants, you can see the loss of pigmentation on the ears of the elephant in the front. Pigmentation loss is a character that can be used to identify indivdual elephants. Elephants are smart and social, and sometimes they seem very much like humans, for example when they mourn their dead. Long term research by Shermin de Silva and colleagues (BMC Ecology, 2011) showed that their friendships are also very much like ours. Who is she hanging out with? 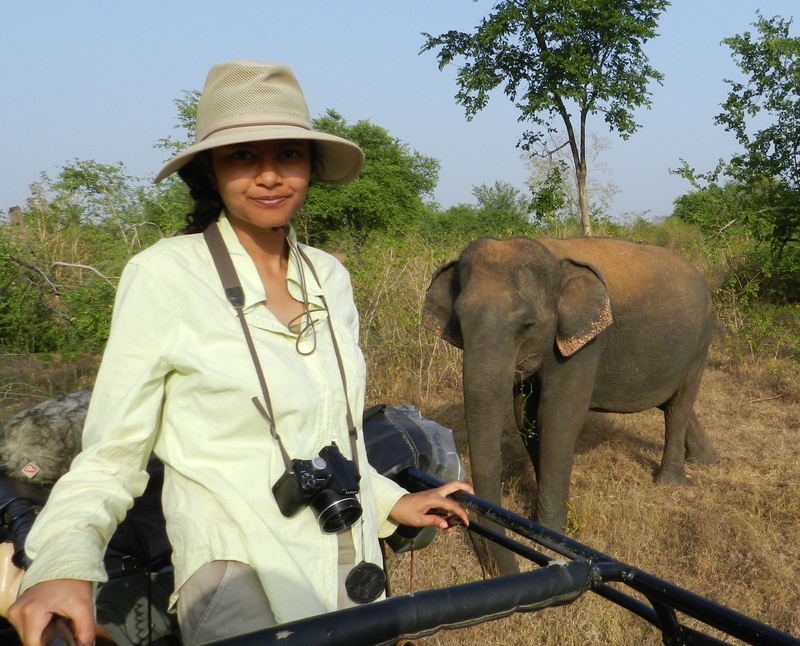 Shermin and her colleagues observed 286 female elephants over 20 months in Uda Walawe National Park in Sri Lanka. Every time the field crew saw one of the elephants, they noted who she was with. The data could later be analyzed using tools from network analysis. How to recognize 286 elephants? But wait a second, 286 elephants … that’s a lot of elephants to remember. You may wonder how recognizing so many individual elephants is even possible for Shermin and her crew. Well, the answer is twofold. First of all, all elephants have different ears. Second, Shermin and her colleagues make pictures of all the elephants they see (always trying to get a good shot of the ears, of course). If they don’t recognize an animal right away, they try to look it up in a digital catalog of photos they take out on rounds with them every day. In case that doesn’t work, the photos can also later be compared to all others in their database. This way, it is not always necessary to recognize each of the individuals immediately in the field. Elephant ears have a lot of characteristics that can help elephant researchers to identify individuals (pictures and text provided by Shermin de Silva). 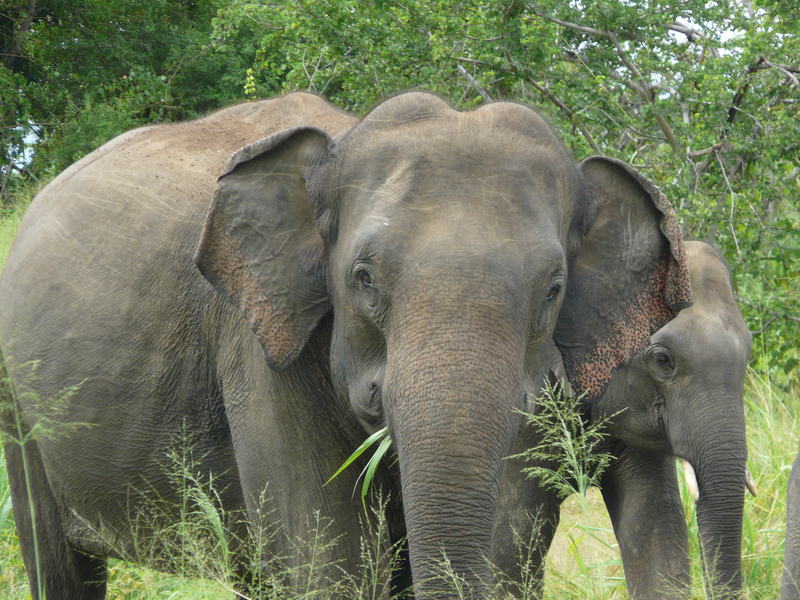 The female elephants in Sri Lanka are usually seen in groups of 2 or 3, so some thought that the these elephants didn’t have very large social networks. However, by following the elephants and their companions over a long time, Shermin discovered that the elephants do have larger networks. Even though they usually move around in small groups, they are part of larger networks that are relatively stable over time. The elephants were often seen with elephants who they already knew well. It seems that they often “stay friends” with elephants they used to spend a lot of time with. This seems natural to me, sometimes I hang out with one friend a lot, and then we may not see each other for a while, but that doesn’t mean the friendship is over! Long term behavioral research is important. We want elephants and humans to live together peacefully in countries like Sri Lanka. To know how this can best be done, we need to understand how elephants (and humans) tick. There are surprisingly few researchers who work with these majestic creatures, especially in Asia. Shermin can only do her work thanks to the support of funding agencies and people like you. I organize a fundraising event in San Francisco on December 21st in the Randall Museum. If you would like to come to the event, that would be great! Tickets are for sale here: http://elephants.brownpapertickets.com/. The money we make by selling tickets goes directly to the non-profit Trunks and Leaves (a registered 501(c)3 nonprofit based in the United States), which uses the money to support elephant research. If you can’t make it to the event, maybe you want to send a few dollars to Trunks and Leaves anyways? All donations, large or small, are very welcome and a few dollars go a long way in Sri Lanka. Donations can be made easily and safely through paypal here. I’d also be very happy if you could share this information with your friends and followers on Facebook and Twitter (see links below post). If you would like to offer help in another way, send me a message at pleuni “at” stanford. edu. If you’d like to learn more about the social life of Asian elephants, check out the original paper here: http://www.biomedcentral.com/1472-6785/11/17. I am trying out something new this month: I am hosting a fundraising event! The event will take place on December 21st in San Francisco in the Randall Museum. 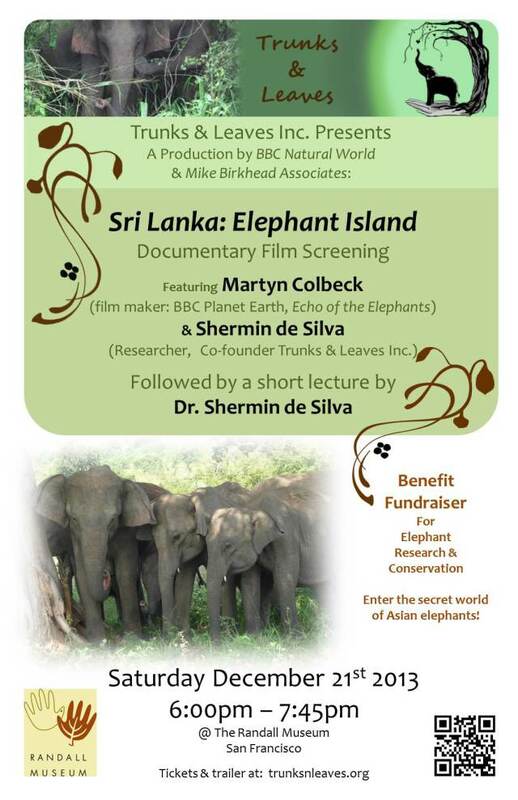 We’ll show a BBC movie about elephants in Sri Lanka (trailer) and my friend Shermin de Silva will give a talk about her work with these same elephants. Shermin is an inspiring woman. She runs a field station in Sri Lanka, works in the United States (she is a postdoc in Fort Collins) and manages to raise enough money to keep her research going. This, as you can imagine, is not easy! Her research is interesting, because she is one of few people who follows individual elephants in a wild Asian elephant population over time. Because she and her field crew know the individual elephants, they can see when elephant friendships form and break. It turns out that Asian elephants have a very different social structure than African elephants (see De Silva et al 2011). Because I think that Shermin is doing great work that deserves our support, I joined the non-profit which she set up (Trunks and Leaves) as a board member. To contribute a little more to the non-profit I decided to organize a fundraising event. Now, I have never done fundraising before, so I am learning lots! Plus, I am used to organizing events for scientists, but this event is for everybody, so that means that there is more for me to learn. If you would like to come to the event, that would be great! Tickets are for sale here: http://elephants.brownpapertickets.com/. The money we make by selling tickets goes directly to the non-profit Trunks and Leaves (a registered 501(c)3 nonprofit based in the United States). If you can’t make it to the event, maybe you want to send us a few dollars anyways? All donations, large or small, are very welcome and a few dollars go a long way in Sri Lanka. Donations can be made easily and safely through paypal here. I’d also be very happy if you could share this information with your friends and followers on Facebook and Twitter.